Received the cover today and it fits perfectly! I live in the woods up here in Washington State underneath old growth trees. The pine needles are beginning to really come down so it looks like I received it just in time. Back in 2015 I contacted your company (see below) to have a cover made for my patio table. I have to tell you that I am so absolutely pleased with the way this cover has held up over time and the protection is has offered. It is so well made! We received our table and chairs covers and our cover for our new sectional and love them! The covers arrived and we quickly put them on our outdoor furniture and they fit great. Thank you so much for working with us. We appreciated your line drawings and very good service and communications. Been meaning to get back to you. The custom cover for my external Lennox A/C compressor condenser unit fits fine and Velcro seam is in the correct spot for the refrigerant lines and power lead. Cover is well made of durable material. Could I get a quote on a cover for this chaise? I bought a grill cover from you a while ago and I’m extremely pleased with the way it has held up. You folks make a truly fine product. Mark, nice job. Fit the AC perfect and stopped the draft! I just wanted to say thank you! I received my cover today and it fit perfect. I will be ordering one for my other air conditioner in the spring when I get back on the ladder to measure it. Thank you again for the fantastic customer service. Cover arrived last week and it is exactly what I hoped it would be. Thank you for your help with this. I am writing you to say thank you so much for our airconditioner cover. We received the package on November 25th. I was pleased to see that it fit our unite just like you said it would. I will be sure to keep your website handy, so should I hear of anyone else looking for such a product, I will be sure to tell them about your company. Cover came today. I am very happy with it. I will definetly recommend your company to people. Have thoroughly enjoyed the AC cover I ordered from you several years ago and now am ordering this one as a gift for my sister and brother-in-law. All the best to you and your business, and many thanks for your excellent product. Good job !! Great Fit! MarineTex Air Conditioner Cover. My AC cover arrived last week. It fits like a glove. I’m extremely pleased. Thank you so much for a fantastic cover and great service! “Mark, We were very pleased with the outdoor furniture covers you made us last month. Covers are absolutely perfect my friend! I’m going to put in an order for a table, AC condenser and heat pump towards the end of summer! Awesome stuff! Mark good morning sir. I received my furniture covers and love them! Thank you. I also received the new cover and it fits like a glove. Love it! The “L” shaped Grill Island cover fits well and looks great. Thanks for following it thru. Mark – product was received last week and fits perfect. We are very pleased. Thanks. Mark, I received the cover and I like it very much. Excellent quality and color, etc.. Thank you ! Great to speak with you on Friday…my wife and I are excited to work with you, and really like your solution to our patio furniture cover needs. Sorry for taking so long getting this message off to you, time has slipped by with so many things going on here. I received the new grill cover and just wanted to once again thank you for the “Quality Cover”, just like the first one that you did for me! It was a pleasure dealing with you and your company and I will call on you in the future! “I would just like to start by saying that we are extremely happy with our recent purchase of the custom fit covers for our walk bridge that are located throughout our golf course. With the product that we received, we are now able to provide adequate protection from the elements while also providing a very classy appearance”. It took a while to get you it but here is the picture of the fire pit cover we received. It fits PERFECT! We are very happy with it. We received great customer service and I am very happy with the quality of the material. Received the cover and I thank you. It fits perfect and I like the slit on the corner. I received the air conditioner cover today and it fits like a glove! Thank you very much for seeing this through. I will definitely recommend your company to ANYONE that I come across that wants an air conditioner cover like I did. Your service was impeccable! Hello – I recently purchased a custom grill cover, and I just love it. You did a fabulous job. I just purchased and had delivered an outdoor kitchen. Can you quote me a price to make a custom cover per the attached dimensions? We enjoy hearing from our customers! We feel blessed serving homeowners and businesses all over the country with our quality American made products since 1989. I love the quality and workmanship of your product. It’s a pleasure to be able to buy something made in America by an American. Received the cover ( Full length Air Conditioner Cover) yesterday evening…..installed it this morning. It fits perfectly. I received the a/c cover (Custom Indoor Insulated Window/Wall air conditioner protective cover ) and am very pleased. I got my purchase yesterday. I am impressed with the quality and workmanship of your product. Kudos to you and your employees. Listen, I am getting to my other house this weekend and will obtain measurements for my two Trane units. I will be in touch with you via your website for my order the first part of next week. Enjoy your weekend out in Colorado. I enjoy visiting Colorado, but the weather is just not for me in my old age. Just letting you know the grill cover arrived last week and was on the grill before Thanksgiving day. It fit perfectly. I needed a little help tightening the bottom, but as years go by I think I will manage that just fine. Thanks for the attention to detail, the workmanship is perfect. A blessed New Year to you and all the employees. I received the cover yesterday evening and put it on today. It fits like a glove. I could not have gotten it right without your help and patience. I’ve already recommended your company to family and friends. Thanks so much! Items received and installed. Everything is a perfect fit. I think it looks much better than I expected and now feel adequatly protected for the winter. It was the only air conditioner I have that I needed help to remove from the window each year and now thankfully I do not. Thanks. I think I would also like to sign up for your blog. The order arrived a while ago but we just put the covers on the swamp cooler and turbine fan, they look great and are the perfect size. We received the Sage Green Marine Canvas full length Green Egg grill cover last night, and it’s excellent! Thank you so much! I forgot to snap a picture, but I’ll send one along soon. Thanks again for your recommendations and help. City of Albany project. The Indoor Insulated Window / Through the wall Super Covers that we ordered worked great. The quality of construction was very good also. They fit snugly around the unit and worked as advertised. As far as I know the customer is happy. I received the two covers ( large custom made to size Indoor Insulated Super Covers ) and just wanted to let you know that they fit perfectly. Thank you for a well made product. I’m glad I found your web site. Air conditioner cover received yesterday. It looks fine. I just received my second custom order from these folks – the first was for a washing machine cover; the second for an awning. There’s nothing these folks can’t do! I’m so delighted with their product, communcation, workmanship, well, just everything about them is cool! What is special is that they are a small family business and their products are Made in USA!!! Shop Small, Shop Local, Shop Made in USA! I received the Super Cover Indoor Insulated covers and LOVE them!!! I live in a high rise vintage building and will definitely spread the word how effective they are in an effort to increase your market share. The AC Cover ( Lt. Gray Superior Marine Canvas rooftop air conditioner cover) came via postal delivery on our Thursday Night, and we have fitted it today (saturday), fits like a glove and colour matches our roof perfectly, is quite windy here today, but with the straps on is barely rippling in the wind, could not be better. Thanks for a great product and great service. I received the custom grill cover for my Big Green Egg earlier this week and I love it. Water beads up and rolls off, the fit is perfect, and the quality is top notch. I’ll never buy a cheap vinyl cover again. From now on, it’s CapCover only! Got the fire pit cover, looks awesome! Mark – I got the cover yesterday for my outdoor TV/Cabinet. It is awesome and just what I needed. MUCH THANKS! Hi Mark – this is the first time I have been here to see the AC cover that I ordered for my mom and dad. It is a very nice product. It fits well, looks good and looks to be well made. Thanks for the quick service on it. Just wanted to drop you a line and say we received the grill cover and love it. It is real quality! I received my outdoor in wall air conditioner cover yesterday from your Company. Not only did you give me great service, but the cover’s high quality is exactly as advertised. We put it on today and it is a perfect fit! The inside tie made it snug, and the extra thick webbing strap was tightened around the unit along the bricks. Unless there are 150 mph winds, this cover will not blow off like my previous one. LOVE LOVE LOVE these Super Covers! Blocks all the cold air through the face of the units. Thank you so much for the Super Cover A/C covers. They are beautiful, fit precisely and keep out the dreaded cold drafts. They do an A/C good!!! Again . . . many, many thanks for a job well done. They are perfect. I won’t hesitate to let any cold friends know about your covers!!! WOW! What a difference your Super Cover has made. Two years ago I purchased a cheap indoor cover from another company and it just did not keep the cold air out and the heat in my family room from going out of my window air conditioner. If you remember I was one of your first customers when I found your Super Cover online and thought I would try it and am I ever glad I did. What a difference your Super Cover has made in keeping my room nice and warm. Received the custom large made to size Super Cover Air Conditioner cover, It’s great! Thank you so much. Have a Wonderful New Year and a Healthy one to you and your family. This is overdue but very sincere. Your product is just outstanding! We put on our new outside window A/C cover on our air conditioner and never had such great results! Our home is draft free. Thanks you for your prompt follow up and wonderful service! We’re delighted that we found you! I received my Super Cover today and it’s great! – thanks. to be the right choice for me. Thanks Mark… The Custom Indoor Insulated Super Cover Window/Wall air conditioner protective cover fits great, looks great, works great. Received the cover and put it on Sun. It fit great! I covered our AC units over Saturday. The covers fit great and look nice. Thanks! We are in the process of shutting our coolers down for the winter. When the coolers are winterized I’ll take pictures and send them to you. I received the two (Window / Through the Wall ) covers about a week ago. My son was away and did not put them on until Saturday. They fit very well and look really nice. Thank you ever so much. I don’t think I ever emailed you back after receiving my cover over the summer. The cover fits perfectly and is working great. Hope all is well with you and your business. What a great product (Window/Wall Outside A/C Cover ) and material is very good quality, hope to get many seasons out of this. But the greatest thing was the fit, outstanding, perfect, and neat. No more general sized covers from big box stores that look like large bags. I will recommend your products to friends. A sincere THANK YOU for helping our K-9 Unit with your Window / Through the Wall A/C cover. Our K-9 command center was installed with a window A/C unit, however on the first rain we realized we needed something that would protect the elements from coming in. The superior quality and customer service you provided us was above and beyond what we had expected….Thank You! The cover was a perfect fit and will last many years without worrying about damage to the A/C unit. From all of us at SARTEC thank you. Mark, Just want you to know that I learned from friends in Vernon, Connecticut about your company and decided to order a cover for my in-wall air conditioner. They are very pleased with your product so I look forward to finally covering my conditioner for the winter! BTW, I do not have any supports. I got the new covers on Friday and just put them on. I wanted to let you know they fit perfectly and look to be very well made! I think for the larger size coolers like I have, it might be best to suggest 4 straps just insure there is little to no movement of the cover during windy times which should make them last longer and also to help keep any air drafts from getting into the home ducts during the winter.Thanks for the excellent service. …I will send you more photos when the project is complete, but the cover looks great and is the perfect size. We received the first batch of covers, thanks. I’d like to go ahead and order the remaining 6 covers. It will be time to start our fall cooler shut down soon. Mark, I received the cover today and it is perfect. Thanks so much, hope to get you some more business from my Egg friends. I just felt it necessary to let you know what a great product you have. The cover for my fire pit arrived on time and fit perfectly! The quality is top notch and looks great when the pit is not in use. Unfortunately, it has been raining here in CT quite a bit, but when we lift off the cover, everything is bone dry and we’re able to enjoy a nice fire right away. Love it! Ordering a grill cover… Ive ordered from you guys in the past. Keep up the good work and I wish you continued success. I just wanted to let you know we went through a brutal snowy winter and a spring with heavy rain storms here in New Jersey. When I opened the grill this week, it was clean and dry and ignited without any problem. Except for a little soiling from the weather, the Superior Marine Canvas was in perfect condition too. I am very pleased with the product and the service that CapCover provided to me and will buy again. Thank you for all of your help. The gray Superior Marine Canvas grill island cover is exactly the quality I had been looking for. Your service was great too. I would like to commend you and your company on the fantastic job of providing a superb product. The cover was an exact fit, very attractive and will last for many years. Excellant! Just a quick note after a few months now, my new fire pit cover I received from you looks great and has weathered our southern heat in Georgia very well. I have received compliments from neighbors and friends about the cover. We love the Goldish/Tan color and it blends in very nice with our deck. Here’s a picture and just a quick note to say thanks from a satisfied customer. I received my cover today. Perfect fit. Super fast service. Could not ask for more. I just wanted you to know that I received my covers yesterday and put them on my air conditioning units today. I was so happy to buy from a family owned American business and receive such high quality merchandise. I was really impressed and happy with your service and your product quality. I received your custom made cover today and am very pleased with the quality. Great product and great service. We received the covers and they look great! Hey, thank you Mark. Hope you have a great year. My boss thinks your covers are great! Also, how much do the straps cost? My window air conditioner cover came. I was able to put it on without trouble and it fit well. I thought the cover was on the expensive side but when I found it was made in the USA by American labor I was more than willing to pay a little more. Hurray for American labor and hurray for you for not out-sourcing! Grill cover arrived today. Husband loves it! Thank you so much. …a cousin of ours from California came out for a visit, and suggested that we purchase a cover for the system similar to one they had. He gave me your name and address, and when I discovered that your company is in Colorado, I picked up the phone and ordered a CapCover. In early June we had an extremely warm week, and discovered that our system was not working. Unfortunately we had to replace both the furnace and air conditioning system. The new system while more efficient is much larger than our prior unit. Alas our old cover which is still in “mint” condition would no longer fit over the new unit. We had been wondering what to do when I found the label that had come with the original cover. After ten years I didn’t expect you to still be in business or to have the same phone number, so many small businesses have hit hard times. Imagine my surprise when I dialed the phone number on the sheet and you answered. I immediately gave you the information on my new system and ordered a new cover. If my memory is correct, the price hasn’t gone up as much as I expected after this number of years even though the style of covers now made has changed to provide better (full ) protection. It’s a very good feeling knowing that you can still depend on some businesses, and that you have remained in Colorado. That doesn’t happen much these days. Thank you for your excellent service, and for sending a cover to protect our air conditioning system. We received our fire pit cover yesterday and it is great! Perfect fit! Thank you so much for your fast delivery of the air conditioner covers I ordered. I absolutely love them and am telling all my friends about them. In fact, my friend from Lake Grove, New York is placing an order this weekend. Thank you for the fire pit cover. It is great and fits perfectly. The color is an exact match for our stone patio and fire pit. Thank you for the time that you took over the phone to help me with the order. I appreciate all of your help. Thanks for all of your help. We are very pleased with the custom outside cover. It fit perfectly. Thank you, It (Window/Wall Outside A/C Cover ) fits great. Good job, and I will recommend you to my family and neighbors. It’s great to see a family owned business. God bless the USA. Hi, Got the AC cover today and it fits just fine. Thanks for working with me on this. Just a word of thanks – the cover fits perfect and matches the others from your company! Have a safe and prosperous day. Got the covers today for my lawn chairs and bistro table and chairs. They fit perfectly. The medium brown color is a bit darker than the previous covers for my bbq pit and air conditioner (I’m a chick, I notice such things) but not outrageously different. I’m all set for fall and winter. Thanks for your help. Thank you Mark. Your product type ( Full Length Marine A/C Custom Fit Protective Covers ) is exactly what I was looking for and since it is made in the great USA, I am sure it will be a quality product. Just received the round fire table cover – looks great fits great! Received the cover right before the most recent snow storm. Fits great and love the tie at the bottom so I can tighten the cover to keep the wind from carrying it away. Just wanted you to know that the covers fit perfectly. Thanks and have a Great New Year. You guys are the best. I will make sure that everyone I know who is in need of air conditioning accessories will hear about you. Thank you and have a happy holiday season. Received your cover last Friday, right before the storm hit, good timing. Anyway just wanted to say it fit like a glove, had it on & secured within 5 minutes. I received the order and it is a perfect fit. Thank you. I received our air conditioner covers today. They are obviously of very good quality and fit perfectly. Thanks for your help. I forgot that the side panels are custom made. I purchased the side panels and the window air conditioner inside cover for the air conditioner that is in my 480 square-foot garage. This garage was done over to be used as a workshop. It is completely insulated and the walls are finished. The overhead door is rated at 17.5 r insulating factor. We didn’t want to take the air conditioner off during the winter because it is bolted into the window frame. Last winter it was very cold in the garage. The side panels and cover didn’t arrive a moment too soon – we installed them yesterday. We can already tell the difference – in spite of the freezing cold outside, it is relatively comfortable in the garage. Thanks for making such a fine product. Just got around to trying the cover on the air conditioner. Great fit, as good as I wanted. I will have no trouble recommending your group to friends. Hey Mark! I just received the swamp cooler cover…it’s really nice. Wow!!! You’re great! I’ll recommend your services to anyone! Again…it’s great to make purchases from my own home state. Recently we ordered a cover for our new ac unit, I thought I would let you know how pleased we are with our purchase. The cover is awesome!!!! We are very pleased w/the product quality and workmanship . Received the cover today (June 29) and it fits perfectly. Color is great as well. Many thanks for your prompt service and excellent product. ( Black Nylon Marine material) are top notch and it fits like a glove. The price was well worth it. Thank you!! You have been a delight to deal with on the fire pit cover…quick to respond, informative, honest and forthright. If you need a referral, please feel free to use my name! Hello—–at last a cover that suites our purpose!!! I am a handicapped person who still works as a university professor and to do so I need to travel 68 miles one way with my scooter on an outside lift on the back of my car. Every cover we used was torn to shreds in no time. I had the idea to look for heavier duty covers, possibly of canvas. I found your website and I received your wonderful cover. It is heavy duty—-even matches the color of my car— a beautiful tan. I felt a little guilty ordering a custom made grill cover for a scooter, but am over the guilt!!! Yet I wanted to thank you for this aid that helps me greatly. I just wanted to let you know my order showed up and I couldn’t be more pleased. The A/C cover fit’s like a glove and looks great! My neighbors are already asking where I got it so rest assured I’ll be passing your company’s name on to them. Thanks for the great work! Thank you for a very nice product. The cover fits my A/C unit like a glove and is very well made. We received our new air conditioner covers today. They fit perfectly, and they are very well made. I’ve purchased a couple covers from you in the past and really enjoy the quality! 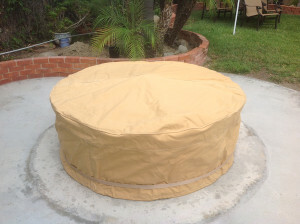 The Fire pit and BBQ covers are great! I’d like to cover my new granite patio table that measures, 72L X 40W X 28 1/2H. Do you guys offer a repeat customer discount? Thank you for your attentiveness to our needs. I really appreciate the phone calls. I don’t usually get this kind of personal service over the internet. Haven’t even got the product and I am very impressed. I just wanted to type out a short note to you. I am in reciept of the A/C covers and side panels that I ordered from you. All of these items fit very well and it only took me a few minutes to seal up my A/C unit. I wanted to thank you for your fine services and products! I would like to say thanks. The cover is a perfect fit. The cover is great. Top quaility. Thanks much. I received the air conditioner cover today and was very pleased with the quality. It fit perfectly. I’ll sure order all of my cover needs from you folks. It’s nice to know that good ol’ American made quality products are still out there. Keep up the good work. We are thrilled with the A/C cover! It fits … and looks wonderful! Yes, indeed! You’ve been a tremendous help to us. We look forward to receiving the cover and straps in time for the long, cold winter ahead! Wow!!! I am simply blown away…. As someone who is in sales and a former restaurant owner, customer service is the key to success and I can appreciate your dedication to customer satisfaction. It is truly appreciated and will share this story with friends. Thank you again in advance and I will keep an eye out for the new cover. I did want you to know that my cover arrived this afternoon, and I am very pleased with the quality of it! As I mentioned before, that early next Spring when our long winter has gone, I will be in touch with you for two more covers, these are for appliances that I have outside during the summer, on the deck. Again thanks, and thanks for keeping me informed. “I received my order on 15 Nov 2004 and installed it – it fits perfectly”. We received our insulated window air conditioner cover today and what a surprise… is so more than we had expected. The quality and make of your insulated cover is fantastic! Please make…. Thanks for the good service – I’ll look forward to seeing your product if it’s anything like your service it will be outstanding. Thanks again. Dear Carol, ..Thank you for your good service!.. ..received our swamp cooler straps today, I placed them on my roof top unit and wanted you to know they really do the job of holding the cover tight to my swamp cooler…Thanks for mentioning them to me!. The Window unit cover is working great. Could you possibly FAX me a receipt, I need this to complete my paperwork. Thanks for your help. Thank you again for your amazing service; the covers are a perfect fit and the quality is excellent. To whom it may concern, I just received my A.C. cover and it fits great. I was wondering if you could also make a cover to fit an Extrol expansion tank for an outdoor well? My measurements are 16 inches in diameter x 36 inches high. It’s important that the cover be 36 inches high.If you can make this cover I would be glad to purchase it. ..Bob has placed our cover on our air conditioner every fall since we purchased it a little over ten years ago, but all good things never seem to last forever, although our car did not last as long as your protective cover has!.. …we wish to order another air conditioner cover. Please make sure and send it to the following address which is not to our Texas address where you sent the original cover…. I just wanted to send this quick e-mail to let you know how pleased we are with your very personal, and quality service. We received the cover and it is wonderful!